"Curiosity: The Story of a Mars Rover" by Markus Motum. The photos and illustrations in the children's book, "Curiosity: The Story of a Mars Rover" (Candlewick Press, 2018), offers an enchanting read for all ages as it tells the story of the interplanetary project. Markus Motum is both the illustrator and author of the detail-filled book about NASA's Curiosity Rover, which is operated by the Mars Science Laboratory at the agency's Jet Propulsion Laboratory (JPL) in Pasadena, California. Curiosity landed on Mars in 2012. Since then, it has celebrated over 2,000 Martian days exploring our solar system neighbor, found evidence of Mars' ancient geology and its past water along the way. If you want to know how this mighty mission began, check out Motum's book for a mesmerizing introduction to its journey. In "Curiosity: The Story of a Mars Rover," author and illustrator Markus Motum creates a Times Square scene in which pedestrians tune into the news of the rover's landing on the Red Planet. Space.com: How did you first become enchanted by space and Mars exploration? MARKUS MOTUM: I wouldn't say Mars exploration in particular. I think as a kid, I was just as interested in the idea of space and astronauts as any other child. The idea that we've actually been to the moon and back was, you know, a pretty big thought. I'm not sure I really comprehended [it] as a child. But for Mars and Mars exploration specifically, it really was back in 2011 and 2012 as Curiosity started to hit the news … that's when I really thought [about the project] and it kicked into overdrive for me. The Curiosity mission itself [was] sort of like a vessel for my interest in that particular aspect of space. Space.com: Do you have any background in astrophysics, or do you come purely from an artistic background? Motum: Yeah, it's definitely the latter. No experience in any of the former. I was one of those millions of people who read about Curiosity in the news and experienced it from my home. And the mission itself got kind of swept up in my imagination and really inspired me. So it pretty much just comes from [that]. ... I don't fully understand the intricacies and all the details and how it's all done. I'm just absolutely in awe from an artistic and from a narrative point of view of what the mission was out there achieving. Space.com: Was there one particular thing about Curiosity that got you thinking that it would be a really great topic to transform into a children's book? Motum: I think it was a combination of a few things. Because, obviously, Curiosity wasn't the first rover to get to Mars. There's been a fair few before, actually, [including] Spirit and Opportunity. I don't know if it was a combination of the sheer daring of the landing; you know, there had never been a sky crane maneuver attempted before. It was totally new, [executed] specifically for this mission. It's the first rover to land on Mars when the internet had really come into its own. I think Spirit and Opportunity [both landed in 2004] were about a decade beforehand. And so now you had the internet and Twitter really kind of acting as this huge platform to get this story out there ... I think with the wider spread of the internet, you could really see the reach that this mission seemed to have. Space.com: In the book, there's a long description about the techniques engineers used to send the probe all the way to Mars. Did you feel that an educational approach was the best way to get people excited about Curiosity? Motum: It's definitely a fine line ... I'm hoping the book works on a few narratives because, you know, it is educational. There's quite a lot of information in there. But at the same time, what gave me the idea to get behind writing the book in the first place was just actually the mission as a narrative, as a story. It was just so amazing, almost far-fetched. It's almost like truth being stranger or more wonderful than fiction, in this case: that we can send a nearly 1-ton rover to another planet and have it land basically perfectly to carry on its mission. And you know, I think the reaction it has for people on Earth — how much it meant to them when it successfully landed, when it sends back pictures — I think that kind of human element was just as inspirational in telling the story as the science behind it as well. This is one of the first pages in Markus Motum's children's book, "Curiosity: The Story of a Mars Rover." The tale is written from Curiosity's perspective. Space.com: What techniques did you use to highlight the themes of "Curiosity"? Motum: I don't know if I did anything specifically. But Curiosity was the first rover or anything that technical I've had to draw before. So one of the biggest challenges of the book was simplifying Curiosity, because there's a lot of moving parts. … It sort of has its own style. Rather than draw every single nook and cranny, I've had to simplify her to fit into this children's book, [and] at the same time, not change anything about her. So that was a unique challenge: To find the parts in there which made Curiosity, Curiosity. [There's] another part of the book where I really had to make sure the detail was scientifically accurate. That's not something I have had to really think about [before]. For one of the original drawings, I think the spread where she's just landed on Mars, the lighting was actually off. We had a Mars expert come on board, and he pointed out that when Curiosity landed on Mars, the lighting wouldn't have actually looked like that. So that entire landscape had to change just to make sure that it held up to scrutiny. Space.com: What was the most challenging aspect of writing the narrative of the book? Were there any particularly challenging technicalities? Motum: Yeah. There were a number of processes throughout the mission that were pretty difficult to kind of [describe], because you don't want to simplify things too much. Because then, you're skipping over too much and you're no longer being accurate. Finding that fine line did take a lot of back and forth between myself and Candlewick [Press]. They were of great help there. And just another part was … after I sent the first draft in, one question which I hadn't anticipated … was, Ah! Curiosity was built in JPL in California. Why did they then move her to Florida to the Kennedy Space Center, where they fired her off to space? There are launch pads on the West Coast, and that's such an obvious question, but that never even occurred to me. So I had to basically find out why ... and even that reason was hard to succinctify into a sentence or two of a children's picture book. So there were just lots of little challenges. Space.com: You said you spoke with experts to make sure it's accurate. Did you have any particular reactions from them? Were any of them enthusiastic? Motum: I think everyone was pretty enthusiastic and very complimentary about it. I think, I guess I didn't quite appreciate the level of detail which was needed to actually portray something. One of the other interesting parts came up where the actual mountains, which are depicted on Mars, were a bit too pointy [in the visuals]. The style of my work is quite angular, so [I had] lots of real, triangular-like mountains. And so, I literally had to shave down the mountains on Mars to get it as accurate as possible to what was actually out there. Space.com: And finally, has the "Curiosity" book inspired you to take on other science book projects? Motum: Oh yes, absolutely. I'm kind of going through the motions of trying to come up with an idea at the moment … something which is going to leap out and grab me quite as much as Curiosity did. Whether it's space or something that's a bit closer to Earth, I'm not too sure yet. Editor's Note: This interview was edited for length. 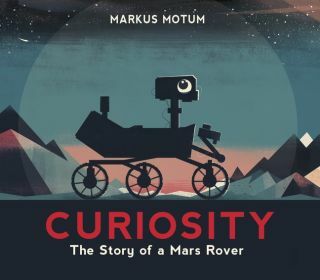 Motum's 2018 book "Curiosity: The Story of a Mars Rover" is available for purchase from Amazon.